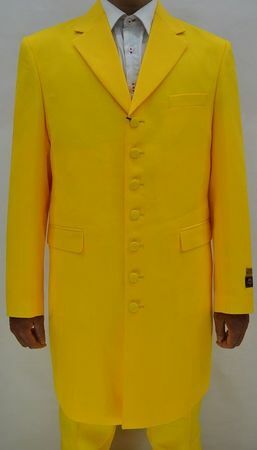 If your looking to stand out form the crowd then this Yellow Zoot Suit 3 Piece Long Jacket Alberto Nardoni Zoot-100 is for you. Put this suit on with a nice pair of black wing tip dress shoes and you are ready to go. It features a 36 inch long jacket with 7 buttons matching vest and pleated baggy pants to finish the look. Made of fine poly/rayon with a wool feel.